A Hellfire missile that the US shipped to Europe for NATO training purposes last year somehow wound up in Cuba. As far as straight up losing sensitive military technology goes, this is one of the biggest screw-ups of its kind. A Wall Street Journal investigation reveals that authorities have no idea how Lockheed Martin’s Europe-bound—thankfully inert—missile sent from Orlando ended up in the Caribbean. The missile did make it to the European continent first, and bounced around Spain and Germany. Then things got fuzzy: it was somehow sent back over the Atlantic, where it went missing until discovered in Cuba. Bewildered US officials have been trying to track the thing down for a year. While this particular missile was empty of any explosives, US officials are reportedly worried that Cuba could share the missile’s technology secrets with China, Russia, or North Korea. The fear is that they might be able to reverse-engineer the Hellfire’s sensors and targeting capabilities to beef up missile technology of their own. The US government is trying to figure out what happened: Spies? Bribes? Or did someone just drop the ball, big time? Officials told the Journal that the massive snafu is emblematic of greater concerns that have surrounded the security of international shipping. 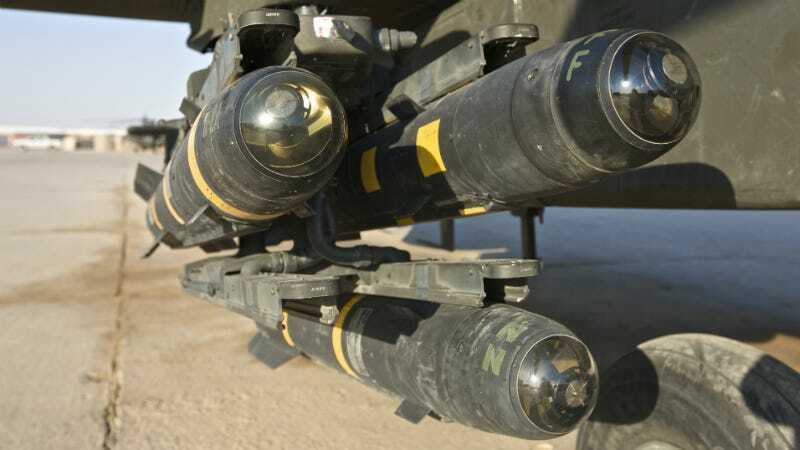 Hellfire missiles are fired from the air to the ground. Helicopters are usually used, but nowadays, they’re being shot from Predator drones in anti-terrorism airstrikes in Pakistan, Yemen, and beyond. On the bright side? If this went down in the ‘60s it coulda been worse. Much worse.